George is a Ghanaian in his 20s. 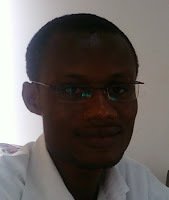 He lives in Accra, and is a graduate of the University of Ghana with a BA(Maths/Economics). He is currently working with one of the Government Agencies in Ghana. He reads and sometimes does some writing during his free periods. 1. You likened the game of soccer to the rejuvenation of the phoenix, a mythical bird. As a player of soccer, can you elaborate on that feeling? I don't remember the last time I kicked a ball but I am a strong follower of the Black Stars of Ghana. The Black Stars peaked months before the 2006 World Cup and months after, they found themselves down and losing matches and this came with criticisms and trauma for the players and everybody. Then lo and behold, they came back with a 'bang'. I tell you the feeling was and is still great!!! 2. The use of words such as ‘powdery ash’ and ‘Abra ka Dabra’ suggests evidence of the supernatural in the game of soccer. Can you tell us how the use of black magic impacts soccer in Ghana? I dont know if it really works but what I know is it gives one team a psychological edge over the other and it also motivates the players themselves. I think it's the 'you can beat anyone because you have something extra' feeling. Some choose to call it the feel-good factor. 3. In the line, ‘The admirers and detractors exchange the emotions they held.’, you captured the sychronization of opposites in soccer. Do you think the same can be said of life in general? Yes I do. Sometimes when you seem to be down and out, some people just won't help but laugh at you. They become very shocked and even sad, though, when you finally make your way out of the problem. 4. Being a Ghanaian, do you think the love of soccer is a patriotic duty or is it an acquired taste? I strong think its both. You acquire the taste and cant help but support your country or play for your country. We all love the game of soccer. 5. As a promising poet, do you think poetry can become a force in Ghana the way soccer is? If so, how? Yes. In fact it was once a force. It went into hibernation and is on the rise as depicted in my poem. don't worry i will give you the best and i know everybody will love it.